The National Register of Historic Places recognizes the historical contributions of Asian and Pacific peoples in the United States and its associated territories. From the early 1800s to the 21st century, Asian and Pacific peoples have played a vital role in the development of the United States and made lasting contributions in all elements of American society. The month of May is Asian-Pacific American Heritage Month and this site showcases historic properties listed in the National Register and National Park units highlighting important aspects of the Asian and Pacific experience in America. Completed in 1849, the Quincy Grammar School set a model for Boston's educational reform movement of the 19th century. By the late 19th century, the school was educating a diverse group of immigrant children, including Chinese, a trend that continued into the 20th century. 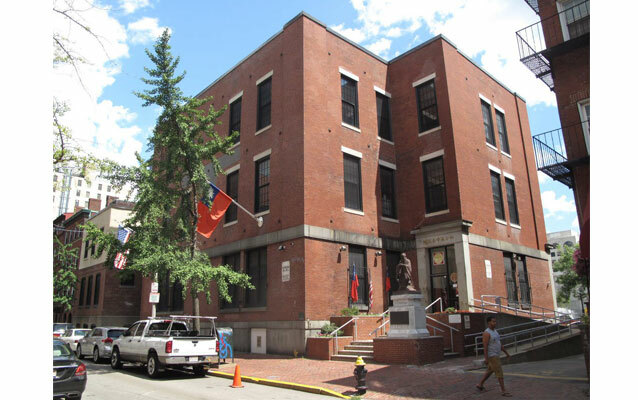 With the arrival from China of large numbers of women and children soon after WWII, Chinatown's population increased enormously, and the Quincy School became the public school serving Chinese immigrant and Chinese-American children. According to oral history and legend, the first Tui Manu'a was descended from the high god Tagaloa and was therefore a sacred personage who was surrounding by elaborate rules and customs of deference and reverence. The importance of the Tui Manu'a extended beyond his home islands to the entire Samoan Archipelago and even to other island cultures in the central Pacific. Hakone was designed and built by talented Japanese designers and craftsmen, and during the late 1930s and early 1940s, a second generation of Japanese talent modified and added to the gardens. For more than 95 years, Turtle and Shark has been widely regarded in American Samoa as the scene of the climactic event of the Turtle and Shark legend (O Le Tala I Le Laumei Ma Le Malie), one of the most famous stories in Samoan oral literature. The Lungs were one of the first Chinese families settled in Austin, and they established and successfully maintained a thriving restaurant business in the city for more than 60 years. The Lung family's experience is representative of the Chinese experience in general in Austin during the late 19th and early 20th centuries. embodies the significant event and trend in history of the United States reinforcing the claim of sovereignty over of the U.S. Territory of American Samoa which over Rose Island. The period of significance is from 1920 when the monument was constructed until the present because it still serves the function of notifying any that visit the island of the historical claim of possession of the island by American Samoa and the United States. The Portland New Chinatown/Japantown Historic District is nationally significant for its history as the largest and most intact Chinatown in Oregon. Between 1880 and 1910, Portland's Chinese population increased dramatically. This was due to new work opportunities that replaced the traditional land clearing, mining and railroad construction work that had been available to the original sojourners. Because the Chinese were confined to a small geographic area, excluded from living in other areas of the city and denied the right to own property, Chinatown soon became a high-density ghetto with over 300 Chinese residents per block. The Sumay Cemetery in Guam was listed in the National Register of Historic Places on October 8, 1999. This site is all that remains of the pre-war prehistoric and historic village of Sumay (pronounced su mai). Sumay village was totally destroyed during pre-invasion bombing by American forces during World War II. The cemetery, which is the oldest permanent historic cemetery on the island, covers an area of approximately 50 meters by 47 meters. Pu’uhonua O Hónaunau National Historical Park, Hawaii County, Hawaii. Extending along the lava flats of the Kona Coast, Pu’uhonua O Hónaunau National Historical Park is home to some of the most significant traditional Hawaiian sites in the Hawaiian archipelago. Encompassing approximately 420 acres of land that extends through three ahupua'a (traditional Hawaiian units of land); the national park contains many other important sites which reflect over 400 years of Hawaiian history. Such sites include the historic 1871 Trail, a 1-mile segment of a trail that traverses the park coastline, as well as the remains of an abandoned farming and fishing village known as Ki'ilae Village. Dinay, known as the place where pottery and fire were introduced to the people of Yap by the gods, has only recently been rediscovered. Using the oral histories from the people of Yap, archeologists were able to find the first villages of Yap. There is no other site like it in the assemblage of archaeological sites on-island; and, it is certainly one of the very few earliest settled sites to be systematically investigated and documented. The Nippon Hospital is the last structure standing in Stockton, California, which reaches back to the early 1900’s when Stockton had one of the largest Japanese communities in the United States. The Chinatown and Little Italy neighborhoods in Manhattan were forged in a dynamic period in American history, from the mid 19th to the early 20th century; a time when waves of immigrants from all corners of the world came to New York seeking opportunity. he garden is the work of Asian landscape designer and Japanese-born Baron Makota Hagiwara (1854-1925) during the time of his association (1894-1925) as chief gardener and concessionaire of the Japanese Tea Garden at Golden Gate Park in San Francisco. The de Sabla Teahouse and Tea Garden is the only other known extant example of his work and the only private Japanese tea garden that survives from the many that existed on the grand estates of San Francisco/Hillsborough. The Tea Garden and Teahouse were part of the El Cerrito estate owned by Eugene de Sabla, who was a major industrialist in the west and co-founded the Pacific Gas and Electric Company. Old Vatia contains a wealth of well-preserved features which help interpret the history and prehistory of the Polynesian Samoans. Read about the young man Wong On who left his village near the city of Canton, China, in order to avoid the Taiping Rebellion, searched for gold in America, founded a business, created a Chinese community, and helped build the infrastructure of the west coast. Likinlulem is an exceptional site in the archeological record of the island of Kosrae, in the Federated States of Micronesia. It was continually occupied from at least AD 1200 to 1600, a period of great importance in the traditional history of the island. James Hishinuma, the youngest of the family, felt it was his duty to fight in the war for the United States. He joined the army and was assigned to the 442nd Infantry Regimental Combat Team. During the era in which Washington Place was built, the Hawaiian Kingdom was a constitutional monarchy, ruled by a native Hawaiian of Polynesian descent, King Kamehameha III. was the first “strictly all stateside” type of building constructed by the U.S. Navy on post-war Guam. Tule Lake was the largest and longest-lived of the ten camps built by the civilian War Relocation Authority (WRA) to house Japanese Americans relocated from the west coast of the United States under the terms of Executive Order 9066. Because Granada’s project director was unusually sensitive to the difficulties facing the evacuees, Granada avoided the conflict and occasional violence that occurred at some of the other relocation centers. Chinatown was founded by Chinese merchants on the outskirts of Riverside, California in 1885 to escape their harassment by Anglo merchants and citizens in the city’s downtown. The area that later came to be known as Little Tokyo in Los Angeles, California started as an ethnically mixed area populated by Chinese, Black and Jewish ethnic groups. Constructed during the 1930s under the Japanese administration of the Northern Mariana Islands, this shrine has survived both the World War II battle for Saipan and the intervening years substantially intact and still retains its original structural components and landscape elements. Built circa 1866 as a trading post, the building later served as a commercial, social, cultural, and spiritual center of the Chinese settlement of John Day. The Garnier Building was once regarded as the unofficial "city hall" of Los Angeles's Chinese community. The Portland Buddhist Church stands as an important reminder of the thriving Japanese community once located in Northwest Portland--it was the first Buddhist church founded in Oregon. The Honolulu Memorial Park, Kyoto Gardens consists of two large columbarium (a structure of vaults lined with recesses for cinerary urns) structures and a Japanese garden. As the mother church for the Shingon sect in Hawaii, the Hawaii Shingon Mission on Sheridan Street in Honolulu is one of the most elaborately decorated Buddhist temples in Hawaii. was a cultural melting pot for Asian and Pacific Islanders involved in Alaska's fishing industry from the early 1900s to the 1940s. this temple may be not only the longest continuously operating temple, but also the oldest "original" Joss House in California. the Mukai Cold Processing Fruit Barrelling Plant stands as a testament to the Mukai family's dream of owning and operating a successful strawberry processing and packing business. The Leluh Ruins are the impressive remains of what was once the political and religious center of Kosraen society. known as the Venice of the Pacific, is a 321-acre central, core complex of man-made basalt islands and architectural remains built atop an atoll. Traditionally, these "mens houses" were used for planning war strategy, rites of passage for young men, and other important aspects of social life, a tradition that is still active today. St. Xavier High School, formerly a World War II-era Japanese radio communication center, is on land that was purchased by the Catholic Church from the local Pwaraka Clan in the 1910s. Designed by architect Yasaburo Yamashita and built in 1926 during the Japanese administration, the hospital was the most up to date medical facility in all of Micronesia. The house and its remaining contents reflect a bygone era of plantations and trading during German and Japanese occupation, colonization, World Wars I and II, and the early Post War Period. The bai, or meeting house, is located in the center of Airai Village on a stone platform that once was the site of two ancient bais. The battle for Peleliu Island, "Gateway to the Philippines," in 1944 was the one of the longest and one of the hardest fought amphibious operations of the entire Central Pacific Theater in World War II. Little is known about who may have created the approximately 50 pictographs that line the walls of the cave or when they were created. This was the first public library built in the southern part of Guam and the only library of its kind to provide English language literature to school children and the residents of Umatac village. Obtaining and returning books was based on the honor system. The Plaza de Espana was the center of political power in Guam for over 200 years during Spanish, American, and Japanese occupation. The construction of the water catchments provided an incentive for Chamorro villagers to consider long term settlement away from overcrowded villages. The Guam Institute, or Lujan House, is one of the few remaining pre-World War II houses in Agana. Ruins and archeological sites in Warren, Idaho, reflect the impact of Chinese immigration to the area. Learn more about a female Chinese immigrant who arrived as an indentured servant. On the coast of California, this small building served as a social, religious, and educational center for the local Japanese community. A National Historic Landmark that served as the West Coast's "Ellis Island" to hundreds of thousands of Chinese and Japanese immigrants. Three neighboring Asian-American communities established in the Delta Region of California by immigrant agricultural workers. This program offers a series of award-winning lesson plans that use places listed in the National Register to enliven the study of history, social studies, and geography. TwHP has ready-to-use lesson plans, available for free downloading, that examine important aspects of Asian-Pacific history. Teaching with Historic Places Asian-Pacific American Heritage Month Feature. Understand the experience of early Asian immigrants and the obstacles they encountered as they struggled to make a living and find a place in American society. Learn what led the U.S. government to confine nearly 120,000 people of Japanese ancestry to relocation centers in remote areas of the country during World War II. Places Reflecting America's Diverse Cultures. Explore their stories in the National Park System. The United States of America is the most culturally diverse nation on earth. People from all over the world have come together to create this country, and they continue to arrive here from many corners of the earth. The National Park Service preserves the historic places and stories of America’s diverse cultural heritage and expands and maintains the National Register of Historic Places. Learn more about the Angel Island Immigration Station, featured in our Early History of the California Coast and World War II in the San Francisco Bay Area travel itineraries and our 1999 Asian-Pacific Heritage Month feature. Visit Seattle's International District (Chinatown), which combines Asian and Western architectural traditions into a uniquely American neighborhood. The National Park Service's Cultural Diversity Program has recently released, Asian Reflections on the American Landscape: Identifying and Interpreting Asian Heritage, which examines Asia cultural heritage found in the American Built environment and its interpretation within NPS cultural resources programs. The publication is available in print and in PDF format. Federal Asian Pacific American Heritage Council was formed in 1985 to promote equal opportunity and cultural diversity for Asian Pacific American in the Federal and Washington, D.C. government. Chinese American Museum is the first such museum in Southern California dedicated to the Chinese American experience and history in this region. Five Views: An Ethnic Historic Site Survey for California, is a publication of the California Parks and Recreation Department, which contains valuable information on the experience of Chinese Americans and Japanese Americans in the state. In 1942, almost 120,000 Japanese Americans were forced from their homes in California, western Oregon and Washington, and southern Arizona in the single largest forced relocation in U.S. history. Many would spend the next 3 years in one of ten "relocation centers" across the country run by the newly-formed War Relocation Authority (WRA.) This report provides an overview of the physical remains left at the sites of the Japanese American relocation. The main focus is on the architectural remnants, the archeological features, and the artifacts remaining at the relocation centers where Japanese Americans were held during World War II. "CRM" is the flagship publication of the NPS Cultural Resources Stewardship and Partnership Programs and contains articles on the full range of cultural resources management and preservation topics. The following issues deal directly with questions regarding Asian and Pacific Islands cultural resources. Since its inception in 1966, more than 80,000 properties have been listed in the National Register. Together these files hold information on more than 1.4 million individual resources--buildings, sites, districts, structures, and objects--and therefore provide a link to the country's heritage at the national, state, and local levels. Search by name, location, agency, or theme to locate National Register properties associated with Asian-Pacific history. The Historic American Buildings Survey (HABS), the Historic American Engineering Record (HAER) and Historic American Landscapes Survey (HALS) collections document achievements in architecture, engineering, landscape and design in the United States through a comprehensive range of building types and engineering technologies, including sites related to Asian-Pacific history and culture. Searches on keywords like "Japanese," "Chinese," or "World War II" will provide information on an array of associated sites. Most of the site records have publication-quality drawings, photographs and historical data. Of special interest are the following properties: the Chee Kung Tong Society in Hawaii, the Joe Shoong Chinese School, and the Chinese Joss House in California. In 1943, Ansel Adams (1902-1984), America's best-known photographer, documented the Manzanar War Relocation Center. Adams's Manzanar work is a departure from his signature style of landscape photography, and includes not only numerous portraits, but also views of daily life, agricultural scenes, and sports and leisure activities. Asian Liver Center at Stanford University is the first non-profit organization in the United States that addresses the high incidence of hepatitis B and liver cancer in Asians and Asian-Americans. They sponsor many events, inlcuding a 5K walk/run in Golden Gate Park. California Office of Historic Preservation preserves and enhances California's irreplaceable historic heritage as a matter of public interest so that its vital legacy of cultural, educational, recreational, aesthetic, economic, social and environmental benefits will be maintained and enriched for present and future generations. Hawaii State Historic Preservation Division works to preserve and sustain reminders of earlier times which link the past to the present. How many places in America can you walk in the footsteps of a king?